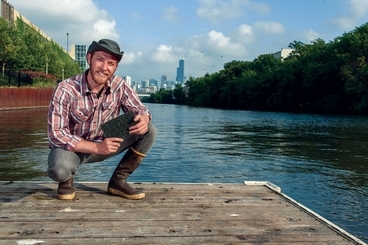 Could this biologist save the Chicago River? Joshua Yellin hopes his BioHaven prototype will lead to more islands here and other urban rivers. The Chicago River often doubles as an open storm sewer. Among the garbage that Joshua Yellin sees bob downstream on the river’s North Branch are Styrofoam cups, soccer balls, cigarette butts, plastic and glass beverage bottles, plastic bags and condoms. Into this jetsam, Mr. Yellin recently added a small, plastic island near the northern tip of Goose Island. His artificial plot—essentially a 10-inch-thick mesh raft seeded with native plants and tethered by a chain—is intended to help restore the river to a more natural state. The underside provides a habitat for fish, as well as microbes that can clean the water of pollutants, while the top is a sanctuary for waterfowl, turtles and insects. Mr. Yellin, an educator at the Shedd Aquarium, installed the BioHaven island as his capstone project for a master’s degree in natural resources and environmental sciences at the University of Illinois at Urbana-Champaign. It was donated by Floating Island International Inc., a company in Shepherd, Mont., that designed and manufactures them. The Chicago River is a challenging environment for a BioHaven island, which is made of nonwoven recycled plastic. Most of the more than 5,000 placed around the world are in lakes or other placid waterways. The river’s current, as well as passing boats, has buffeted the 5-by-10-foot mat, damaging its edges. Ducks, meantime, have eaten much of the plant life, which included wild iris, hardstem bulrush and prairie cordgrass. Mr. Yellin, 29, is rebuilding his artificial wetland. He is making it twice as thick, which should allow it to float higher in the water and enable the plants to take better root. He also is constructing a ring around its front end to shield it from debris. A Chicago native, Mr. Yellin headed to Montana after he graduated from Illinois in 2007 with a degree in integrative biology and psychology. In the wilderness, he learned to fly fish and fell in love with rivers. After a stint guiding canoe trips in Alaska, he returned to Chicago in 2011 to work for Friends of the Chicago River. A BioHaven island like the one on the North Branch costs about $1,250, plus year-round maintenance. Mr. Yellin is hoping his prototype will lead to more islands here and other urban rivers. The other day, he spotted more than 100 small fish eating under the island and possibly spawning. The river may be damaged, but it isn’t irretrievable.